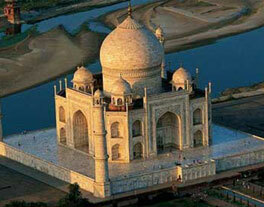 The Taj Mahal of Agra is one of the Seven Wonders of the World, for reasons more than just looking magnificent. It's the history of Taj Mahal that adds a soul to its magnificence: a soul that is filled with love, loss, remorse, and love again. Because if it was not for love, the world would have been robbed of a fine example upon which people base their relationships. An example of how deeply a man loved his wife, that even after she remained but a memory, he made sure that this memory would never fade away. This man was the Mughal Emperor Shah Jahan, who was head-over-heels in love with Mumtaz Mahal, his dear wife. She was a Muslim Persian princess (her name Arjumand Banu Begum before marriage) and he was the son of the Mughal Emperor Jehangir and grandson of Akbar the Great. It was at the age of 14 that he met Mumtaz and fell in love with her. Five years later in the year 1612, they got married. Although such a devotion to a wife reaching to build a monument seemed like a weakness for an emperor, Shah Jahan was clearly determined. He chose a peaceful site by the River of Jumna about one and a half miles away from Agra on the southern edge of the city, where could be seen from the Agra Fortress. The closeness to the river also met the water need for the construction and garden. Shah Jahan decided to move Mumtaz to Agra in December 1631 and was buried in a domed building temporarily on the construction site of the unique mausoleum in January 8, 1632. Mir Abul Karim and Mukamat Khan was positioned as supervisors of the construction , however the architect was never mentioned by the Mogul Empires historians that left questions and disputes about the architect. Even though some insists that the building was the work of a European, the Venetian Geronimo Vereneo, there is no trace of European architectural style. Also Vereneos tombstone in Agra, where the Christians were buried, it was stated that he died in Lahore but nothing more about the construction of Taj Mahal. The most reliable architect might be Ustad Ahmad Lahori, who was the architect of the Red Fort of Agra and most probably took part in the construction of Taj Mahal, which was indeed emphasised in a poem of his son Lutfullah Muhandis. The body of Mumtaz laid for the third and the finally at the center of the mausoleum on north-south with her face turned westward to Holy Mecca in May 26, 1633. The three-domed mosque was situated on the west with its alcove namely mihrab pointing the direction of Mecca for the prayers. The mosque on the east side might not used as a mosque in purpose but a pilgrimage guesthouse as the back wall was not marking Mecca. It might most probably build for the symmetry or echoing. The place was important for the pilgrims as Mumtaz died in childbirth who was considered as martyr following Islamic traditions. The building is influenced mostly from central Asian and Persian architecture combined with Muslim architecture. The construction was finished in twenty-two years with the power of twenty-thousand workers. Also the intricate stone carving usage, the domed kiosk namely chattri, are the traces of Hindu architecture. The characteristic Mogul octagonal design with eight chambers representing the eight divisions of the Koran was used in Taj Mahal and was topped by a gigantic double dome. The inner dome is about eighty feet from the ground. The gigantic outer dome rises like fruit or a flower bulb with its excellent proportion and is surrounded by four domed kiosks. The platform with 970 feet length and 364 feet width raising the mausoleum from the ground is surrounded by three storey four minarets on the corners with 139 feet height and completed with octagonal chattris. The building was made with mathematical calculations leaving no space for a fault in symmetry and balance. Brick, red sandstone and white marble were commonly used as the three main materials and finished with polished plaster on the surface. The constructions started in January 1632 with approximately five thousand labourers both local and from the other places of the empire with the marble platform. The huge white marbles were carried from Makrana on southwest of Jaipur (Amber) about four hundred kilometres away; stone cutters and carts were also rented as the order of Empire to be paid by the Empire Treasure. The marbles were cut flawlessly without any crack. In fact the mausoleum was not of pure marble but of bricks faced with marble. The bricks were made nearby the construction area, therefore, eliminating the transportation problem. Although it is not certain, the brick scaffolding might have been used rather than bamboo or the wood, if the weight and the worth of the materials were considered. The three feet above the ground was faced with marble, continued then with marble like plastered bricks in the interior parts of the mausoleum. Because the use of images of human or animal is strictly prohibited in Islamic traditions due to the belief of equalising the images with God, Islamic calligraphic designs, mostly writings of Koran, were commonly used inside and outside of the pure white building as the very important art of ornamentation. The talented Persian Abd-ul-Haqq with the title of "Amanat Khan was positioned in Taj Mahals calligraphic decoration who was before appointed by Jahangir on Akbar's tomb. He was also reputed to be the only one who was allowed to sign his works in Taj Mahal. His dated signatures give clues about the building duration and also reveal that the calligraphic works were started from up to down in utmost artistry. While the calligraphic work of the mausoleum was nearly completed by the end of 1637, Amanat was promoted and rewarded honourably by Shah Jahan with more salary and an elephant. According to the unsigned work on the gateway dated 1637 unfolds the magnificent inscriptions on the tomb was however must have been finished by another as Amanat Khan died around 1647-1648 after his last signature on the north front of the great gate with the inscription Finished with His help, the Most High, *1057"(*lunar calendar). Also, the stone carvings and especially in mosque and guesthouse the floral themes as the sign of paradise are also considerably used in Taj Mahal as the main ornamentation types together with more than forty different types of gems came from various countries. Also some caravanserais were also built for the merchants and carriers around the construction area in order to meet their needs. The paradise resembling spectacular Tomb finished in 1643 while the every part of the complex had not been completed until 1653. 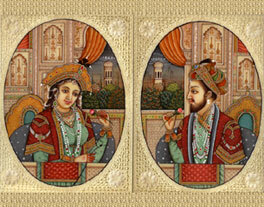 The night of the 6th February 1643, was the first ceremony of the mourners of Mumtaz Mahal. aj being blemished by British soldiers and government officials who also deprived the monument of its immaculate beauty by chiseling out precious stones and lapis lazuli from its walls. Also, the British style lawns that we see today adding on to the beauty of Taj were remodeled around the same time. Despite prevailing controversies, past and present threats from Indo-Pak war and environmental pollution, this epitome of love continuous to shine and attract people from all over the world.